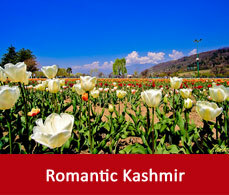 Kashmir portrays a different scenic beauty in various season of the year. 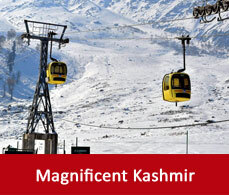 But the best time to visit Kashmir is from March to October. It is colourful in summer and spring and is a white beauty with the snow cloak in winter. 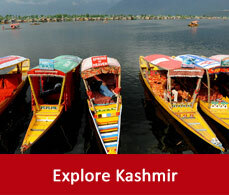 During the summer Kashmir comes alive and turns into a fruit basket. Each and every tree comes lively with the fruits like strawberries, peaches, cherries, apricots and many more. The paddy fields rise in the spiraling terrace of the mountains turns into vibrant green. The snow topped mountains encircling the colourful valley in Summer makes it more lively. During the mornings the valley gets draped up in the sheet of mist. As the sunlight falls on the dew drops it sparkles with the message that winter is knocking the door. The sounds of the fallen leaves makes this message more strong and the fragrance of the flowers lingers on your nose. Winter drapes the valley in a white sheet of snow. Starting from the trees to the lakes every piece of this paradise turns into the mystical white beauty of snow. It is frozen and chilled at all time of the day. The sunlight falling on the snow clad mountains deflects its warmth to the whole valley.